I finally caved and bought a “new” car to replace my 11 year old ride. That meant I needed new vinyl stickers for my car! The first set I ever made was when I first got my Silhouette cutting machine, and I was expecting child #4. I bought a pre-designed set that was cute but common. Since then, I’ve been designing my own. I love retro and “old school” pop imagery, so I turned to my favorite arcade game for my inspiration. 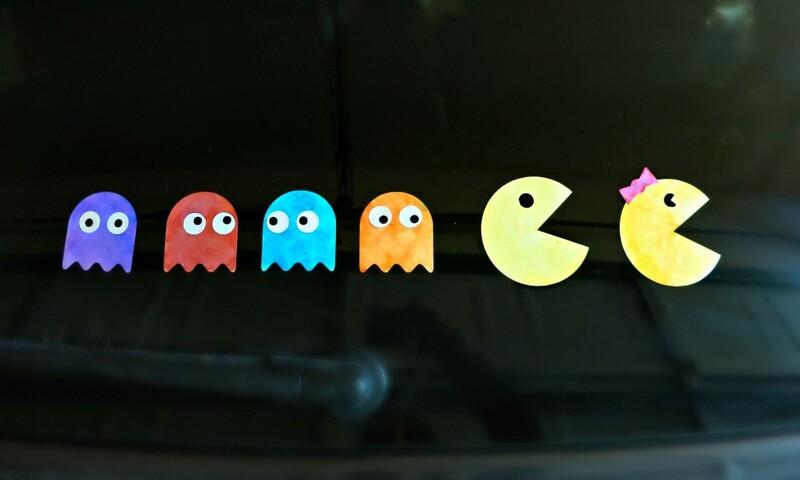 Since I have 4 kids it seemed like a no-brainer to make Pac-Man family vinyl decals for my car! PS…if you’re crazy about Pac-Man, too, then you’ll love this blanket I made! Step one: Download and open the free template. You can find both the .svg and the .pdf files HERE to download for free. Step two: Cut the designs from white vinyl. 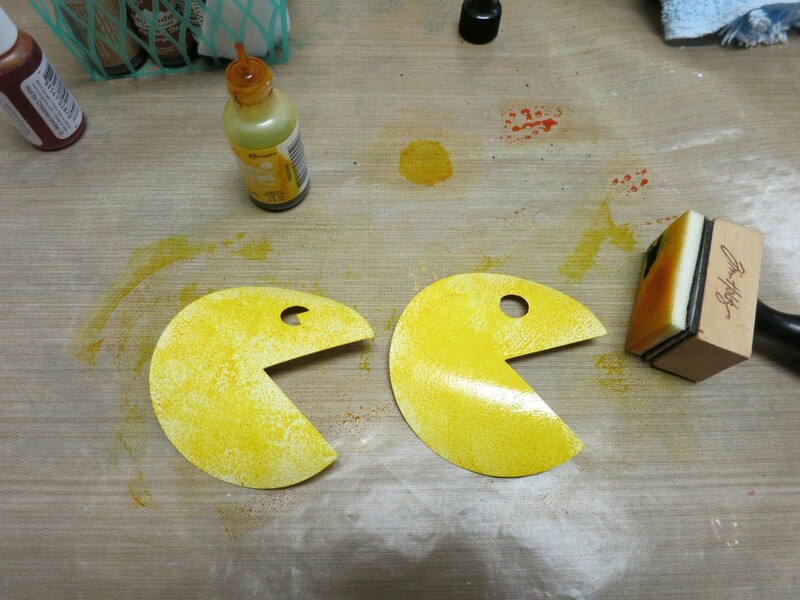 Step three: Weed the vinyl to remove the ghost and Pac-Man shapes. Place them on a craft mat. 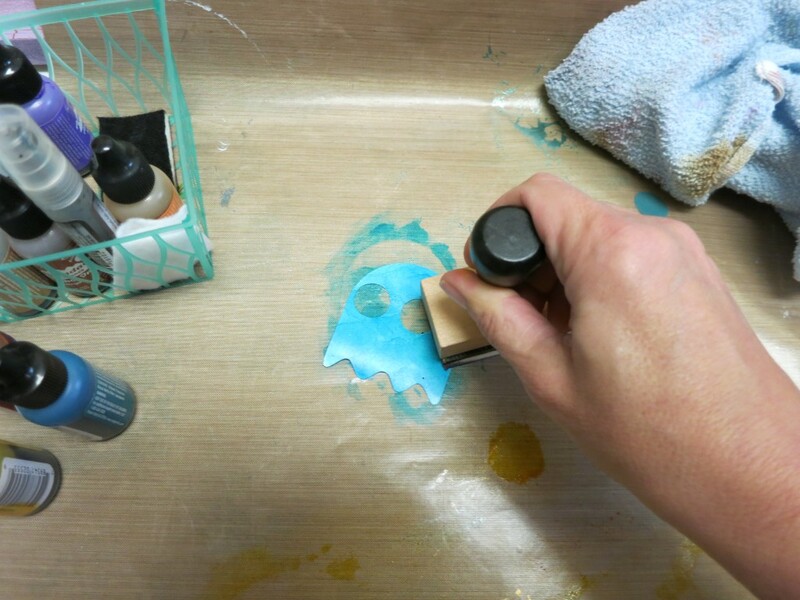 Step four: Use alcohol inks to paint the vinyl. Pick up a bit of ink with the foam square and dab it on the vinyl. Let the ink dry completely. Step five: Clean the glass of the car well. 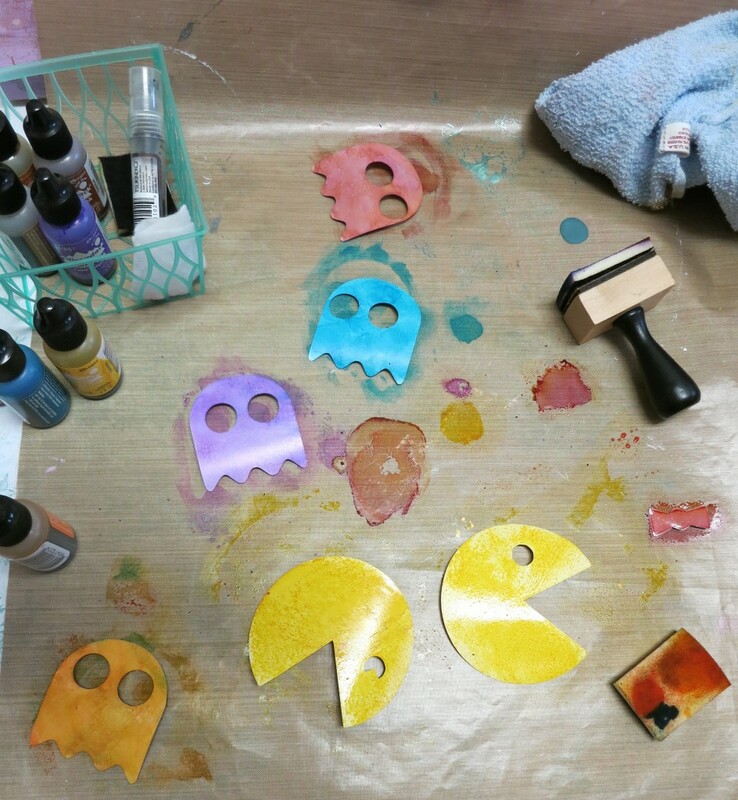 Peel the backing off the vinyl ghosts and Pac-Men and adhere them as desired. Smooth out any air bubbles. Peel the backing off the white vinyl eyes and add them to the ghosts. My kids LOVE our Pac-Man family car vinyl! They’ve each decided which color they are. Of all the car decals I’ve made, I think this one is their favorite. My favorite is still the zombie decals I created in this post, but I also really liked my Muppet vinyl decals shared in this post. My youngest has requested Minion vinyl decals next! I’ll try my best to oblige! 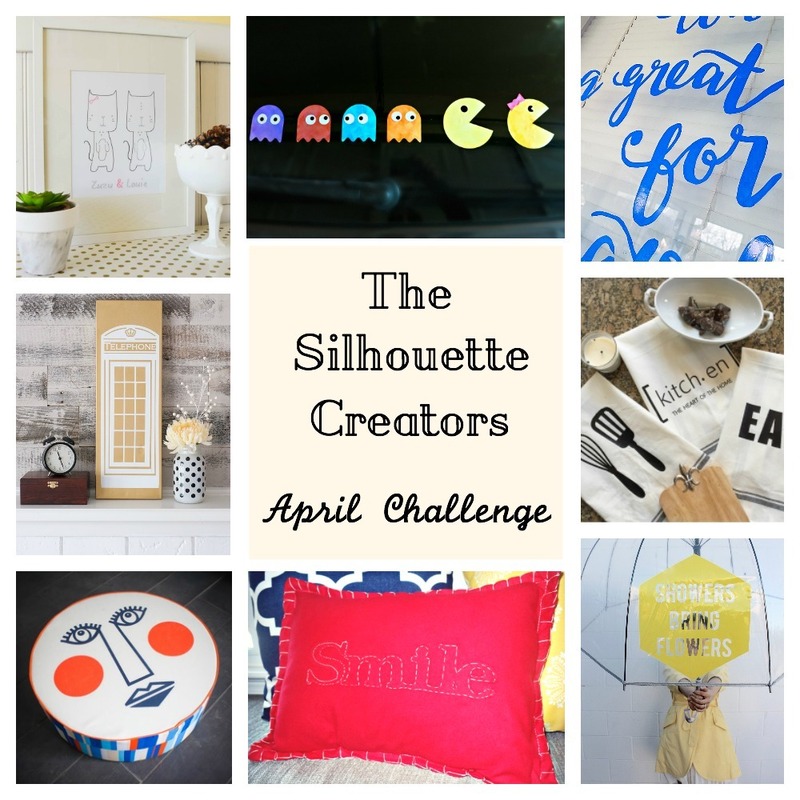 I’m joining with several other craft bloggers to share fun Silhouette projects with you! This would totally make me chuckle if I saw it on the road. LOVE IT! Such a good idea to add ink to vinyl, too. Oh how unique! I love how use the alcohol inks for a cool watercolor effect – I never would have thought to do that! Love nerdy car decals and this one is definitely awesome! Thank you! I was worried if the ink would hold up in the rain, and I’m happy to report that it DOES! How do you get the black innthe center of the eyes? My windows are tinted very dark, so that’s the black you see. If you’re windows aren’t as dark then you’ll need to cut circles from black vinyl.